Kale Pesto is the Bomb! How do you get those super healthy greens into your diet? This Kale Pesto Recipe is the bomb baby! It makes it easy to eat your kale and combines it with other super power foods, like nuts and apples. Full of fiber, Omega 3s, Vitamins A and B, Calcium and Magnesium, it’s a great dip, spread, or sauce option. Kids will never know the difference! 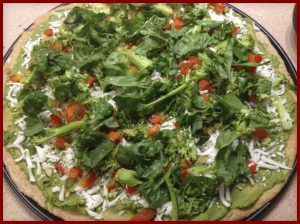 Give it a try on a My Spelt Crust Veggie Pizza, on pasta, as a veggie dip, or as a sandwich spread. Hope you try it! Toast nuts at 350 for 7-10 minutes or until light brown. Wash kale. Clean leaves off the stem and measure 2 cups packed down. Put kale and all other ingredients into a food processor or blender and mix together on high until mixture is smooth. What Should You Do with the Rest of Your Kale? Try my Lemon Garlic Kale Recipe!